Children illustrating the sermon, during the sermon -Up Front! The responses were multiple and lively reflecting a broad interest in the subject. The response also offered a rich survey of resources and tools available. The links posted on Facebook and below all received multiple thumbs up… Of course, check with your own denomination’s publishing house for ideas and resources. BUT first a personal word… before diving in and before even thinking about creating a message for children that is a part of worship, read the following two blogs about Children’s Sermons! 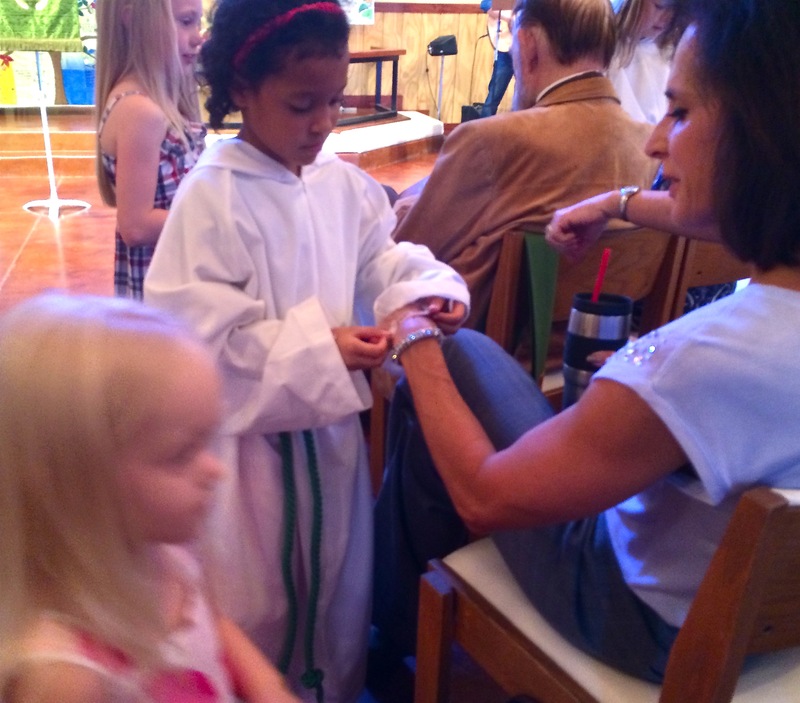 Also give thought to how to authentically engage children IN the actual flow and movement of worship. 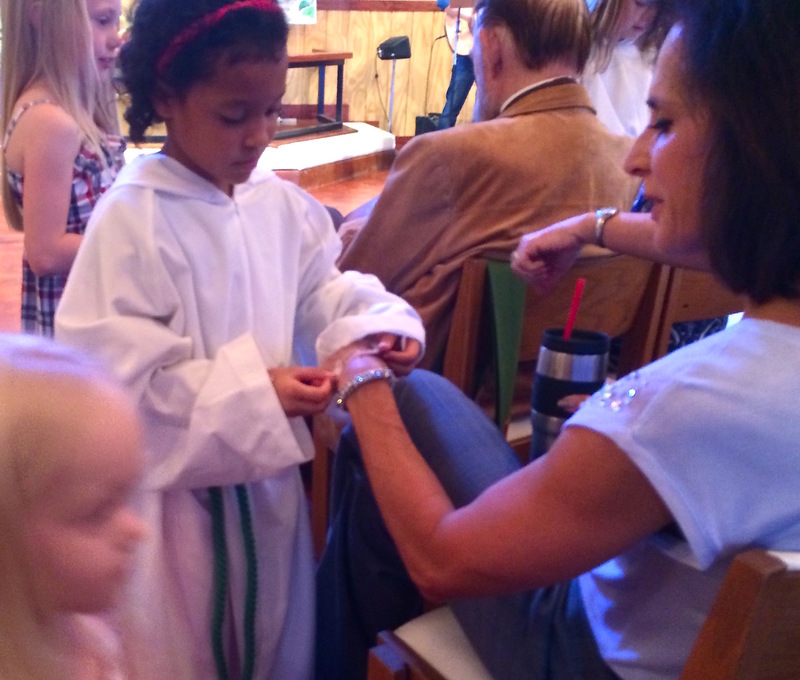 Should there be a Children’s Sermon? Faith Formation Journeys offers not just ideas, but an entire message for children which follows the lectionary. Solid theology and age appropriate. Written by a team of clergy and lay who “get” kids and faith formation. Faith Ink – teach a Bible related song! Creative and involves movement. Practical Resources for Churches is a resource center offering comprehensive guides, webinars and resources, including one for “Selecting Curriculum” and hyper-links to each one reviewed. Sermons4Kids is a good starting point for children’s sermons. Use the basic idea, but change it to fit the worship service, your theological lens and personality. Spark House and Spark Curriculum for all ages. Resources for Preschool to 6th grade. Age appropriate, creative, theological sound, and relevant at each level. Crosses denominations. Story Path links themes of faith and stories found in the Bible with children’s literature. Text Week is a comprehensive sermon prep site that also offers ideas for children’s sermons based on the texts for the liturgical day. You’ll find the “With Children” section under the Sunday/text you choose. And finally a link to Rows of Sharon, a blog by the Curator of all curators, Sharon Ely Pearson. An extensive list of resources related to Children and Worship. I trust any and all suggestions from Sharon. Many children’s sermon resources are law-based, almost “what we have to (or should) do so God will like us.” I renamed my children’s sermon time “Gospel Time” some years ago when I had youth a bit older than those normally called “children” coming forward, but it also helps me to make sure the message is “good news” for the youth and adults in the congregation. Michelle R.
On the weeks that the various ideas don’t click with me, I pick an aspect of liturgy or an item in our worship space to talk about: a symbol in the stained glass, why we pass the peace, the benediction, the dismissal, etc. I always hear from the adults that they learned something new too. Michelle B-K.